Google seems to recreate the Motorola's miracle with the new Moto X since it became the owner and parent company of Motorola. And it does. This long-awaited Moto X surprises us in every nook and cranny. Particularly, it's amazing to play new DVD movies on Moto X's 4.7-in display with a 720 x 1280 resolution. Below we'll list specs of this Google's new Nexus phone and show you how to rip DVD to Moto X readable format for watching limitlessly. It's handy to import homemade DVD movie to Moto X for playback with the aid of DVD ripping software. But when facing copy protected DVDs, many DVD rippers will at loss. Don't worry, MacX DVD Ripper Pro is the best DVD to Moto X ripper for Mac OS X that has been tested and proved with standout performance, especially in disabling any copy protection measures on newly released DVDs, be it CSS, region code, Sony ARccOS, Disney new copy protection, etc. It is able to decrypt and rip DVD to Moto X supported format like MP4, H264, WMV, etc and convert DVD to Motorola Droid RAZR HD, Moto X Play, Moto G3, Motorola XT760, Google Galaxy Nexus, and other Google devices like Google new Nexus 7 without any hiccup. Free download the Mac DVD ripper for Moto X and copy DVD(homemade & encrypted) to Moto X on Mac(macOS High Sierra/El Capitan also supported) with high quality. Free download Moto X DVD ripper on Mac OS, install and run it. Import the new movie DVD releases you'd like to rip by hitting "DVD Disc" button or simply load DVD folder and ISO by clicking the relative button on the main interface. Tips: MacX DVD Ripper Pro supports the latest Mac OS including macOS Sierra/El Capitan, which means you can even rip DVD to Moto X on macOS Sierra easily. From the pop-up small window, you can choose "Android Mobile" --> "to Google Mobile Video" --> "General Mobile Video" as the output video format. And then click the "Done" to return to the main interface. With the above steps been finished, click the "RUN" button to start to rip copy protected DVD to Moto X on Mac computer, you could view the conversion progress and are able to cancel the converting process at anytime. 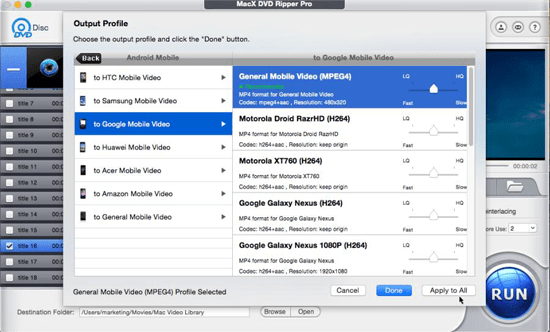 Of course, if you wanna play the converted DVD content on iOS devices, you can rely on MacX MediaTrans to easily transfer video from computer to iPhone iPad iPod. 1. Decrypt any encrypted DVDs, including DVD CSS, region code, RCE, Sony ArccOS, UOPs, Disney, etc. 2. Support copying any protected DVD on Mac in four modes including Main Title Content Copy, Full Title Copy, Clone DVD to ISO Image and Backup DVD to MKV. 3. Rip DVD to MP4, H.264, MOV, FLV, MPEG, M4V, AVI, QT, etc. 4. Convert DVD Movie to iPhone 5S/5C/SE/6s/Plus/7/X/8, iPad Mini, Android Samsung Galaxy, HTC one, Google New Nexus 7, WP8, etc. 5. Trim, crop, separate and merge video, add subtitle to video before DVD ripping. 7. Upload DVD Videos to Google, Facebook, Vimeo and so on. This DVD to Galaxy S4 mini guide will help you know how to rip DVD to Galaxy S4 Mini on Mac for you play DVD on Galaxy S4 mini anywhere you go. Notice: We only advocate using this best DVD ripper to rip commercial DVDs to Moto X under the concept of Fair Use and do not encourage any illegal reproduction or distribution of copyrighted content. Please abide by the local DVD copyright law before doing it.